This is an oral steroid and it's presented in little, oval-shaped, yellow-redish capsules. 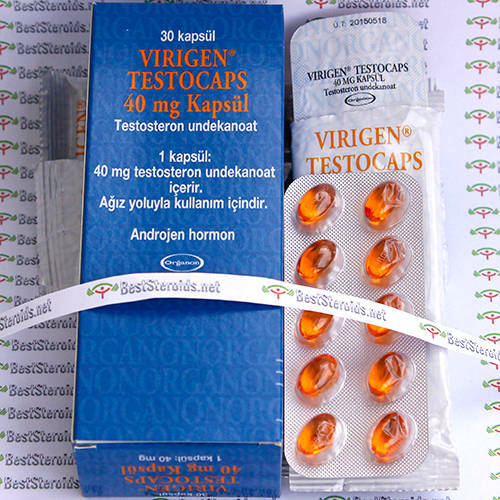 An oil, which contains the testosterone, is inside of these capsules. Virigen is an unique steroid in that it is not an alpha alkylated 17 steroid. The only bad thing about this base is that it only allows the testosterone to remain active in the system for several hours. Thus more frequent administration of the capsules is necessary. Aromatisation is minimal with this agent. 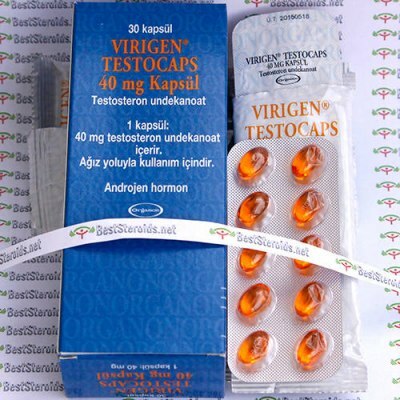 The substance testosterone undecanoate contained in Virigen Testocaps, however, is reabsorbed from the intestine through the lymphatic system, thus bypassing the liver and becoming effective. The liver function is not affected by this. Virigen aromatizes only minimally. The users of Virigen (andriol) do not experience feminization symptoms such as gynecomastia or increased body fat. Restandol's non-aromatizing quality consists of the fact that the body's own hormone production is only affected after a long-term administration of very high dosages. safest testosterone you could find. high price, no sides.